Last month's Vermont section confirmed Coleen's health well enough to give us mixed emotions about the next challenge. 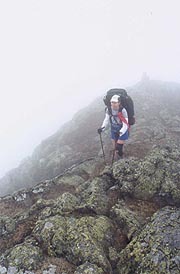 Not only will it be our longest section to date; it's Maine, reputed to be the wildest and most rugged terrain anywhere on the AT. Certainly the first few days will be tough, a sawtooth pattern of climbs and descents, worsened by Maine's reputation for marching straight up every climb - switchbacks are for southerners. There are streams to ford, boulders to climb, boot-eating bogs, and the endless exposed roots; yet many hikers count Maine their favorite section of the trail. We don't quite know what to expect, but somehow we feel up to the challenge; and we're dying to see the lakes, the loons, the moose - the AT as it was envisioned. It's time for a walk on the wild side!! For most AT hikers, their final assault on the 100-mile wilderness at the trail's end is launched from Shaw's Boarding House, an icon of trail lore located in Monson. We wouldn't miss this for anything (especially after Bryson's amusing description in 'A Walk in the Woods'), so we pulled in last night, having arranged to use the guest house and signing up with Pat for breakfast at 7:00, just before our shuttle. Me: "We'd arranged with Pat to have breakfast at 7:00"
Shaw: "That was then - this is now. Get that girl of yours over here - this grill's costing me money!" It�s obvious we'd met the character of Bryson�s book, and I laughingly get Coleen around, joining Smurf, a northbounder ready for his final assault on Katahdin, though he�s skipped a section since catching ill in the Whites. Soon we�re stuffed, and the Shaws� long day begins, with young Keith running one shuttle into the wilderness before returning for our own shuttle (himself having been roused by his Dad at 4:30). Driving to Rangeley his frustration with his Dad is evident, but it�s good for us to get an early start, and it�s a great morning for a hike � pleasantly cool and gloriously clear. Keith�s been helping out his Dad here almost since he was out of diapers, having come along just after Dad started taking in hikers in 77. They board a few hunters and such into the winter, but hikers are the mainstay, and Dad had spared no venom over breakfast dispensing folklore about his local competition, the Pie Lady. Our first "2-hole" privy - the sign reads "Your Move"
We�re in high spirits as Keith drops us at the trail, crossing a small stream, and heading up a muddy mess of horrid trail that peters out quickly in the woods. Backtracking to our last blaze, we find the trail turned without a clue, something we�ll find all too common here in Maine. Still, it�s beautiful trail, and nowhere near the difficulty we�d been led to expect climbing Saddleback Mt. 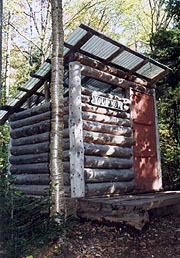 Soon we pass a cute privy-shaped building with a huge sign � �Not a toilet� neatly emblazoned, followed soon after by the Piazza Rock Lean-to, where we take our first break. A nice shelter, it sports a huge woodpile behind, and a two-hole privy, with its own sign, labelled, �Your Move� (even a cribbage board inside). The "Maine-tainers" obviously have a sense of humor, and soon after we�re forging up Saddleback, passing Ethyl and Eddy Ponds, searching in vain for moose. Soon, the trail seems too easy, and Coleen mentions we haven�t seen a blaze in a while, finding to our dismay that we�re off the trail. We try to intersect the AT, but soon end up backtracking, finding at last where the AT diverged off the far easier snowmobile trail. Now we�re forced onto a rocky, root-ridden trail, and with no great surprise, when it finally crosses the snowmobile trail there are no blazes anywhere in sight. 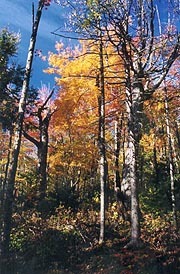 Soon we break out above treeline, the cold wind hitting us mightily, although the beauty is stunning. A cleft in the rocks shelters us from the wind for lunch, followed by a beautiful walk to the summit. The beauty defies description as we cross a small saddle and back up The Horn, with a peek at the ski resort on the mountain�s back side. After a quick break we push on to the third and final peak � Saddleback Junior, from which begins the descent towards tonight�s destination, the Poplar Ridge Lean-to. We pull in at 5:56, surprised to find another hiker already there who looks pleased to see us. It�s �Speedy� � a trail maintainer in the Whites and general hiking enthusiast who hiked the Presidential loop in 9 hours, hence the name. He�s a nice guy, although on looking at the shelter we elect to tent outside instead, as this is one of the few remaining shelters with the �baseball bat� decking, the floor built of round tree limbs the diameter of baseball bats. Even Speedy admits it�s none too comfortable, and we move onto a tent site just in front of the shelter, deciding to attempt a fire. Speedy helps me pull down a dead tree for fuel, and before long we�ve got a decent fire going, although it requires some maintenance to keep going. We have a good time chatting, and Speedy turns in early, ourselves taking the register and an informative pamphlet left by the shelter caretaker Dave Fields to read, with lights out at 9:30.
but also dream; not only plan, but also believe." 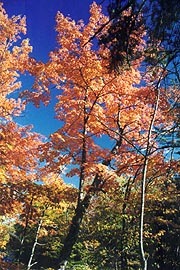 The Maine lake country is full of autumnal color below. Our 3rd and final peak for the day - Coleen's had enough climbing for now. Today we've a long 15 mile day planned, hurrying through breakfast to get out at 7:50, shortly before Speedy. We begin with a short ridge walk before plunging down a deep canyon to Orbeton Stream, our first ford according to the Data Book. It turns out to be an easy rock hop across, followed immediately by our day's big climb up Mt Spaulding. The skies begin to gray as we slug uphill towards Lone Mt, the 1st summit on our route, preceded by one level section giving us a false hope of having reached its summit. After finally topping Lone Mt, we hear voices off to the left, never finding their source, but just after passing a hiker off to our right, just getting up and around for the morning. It's Dark Forest, a southbounder who got a late start and is perpetually cold (as we'll find from every shelter register - wait'll he hits the Whites), slowed by a lost headlamp and his morning sloth. We're also leapfrogged a couple times by Speedy, out peak-bagging, and as we stop for lunch at the Spaulding Mt Lean-to we run into Skippy, a southbound Aussie lady over with a friend of hers as her friend attends a work conference in Portsmouth. She's a delightful lady, having already done the Whites, and hoping to make it down to Gorham before winter closes in. There's a steep, but bearable climb over Mt Spaulding, followed by a short ridge walk aside Sugarloaf Mt, and thence our steep descent to the Carrabassett River. Typical of the others we've climbed, it's tough in places (there's one rocky, windy, and very exposed slide down the west face that seems most unfair, as if planned to maximize our discomfort), with other parts surprisingly easy. We're expecting another ford, but luckily someone has placed a hefty plank across the wide section that couldn't be rock-hopped. It's about 4' in the air, sagging quite a bit in the middle, but it holds as we both gingerly cross, it's a short and gentle uphill to the Crocker Cirque campsite, our planned destination. We pull in at 6:15, a fair amount of daylight left, and finding several tilted tent platforms here, I recon the site for the most level one as Coleen heads back to the stream for water and a bath. I find a blue-blazed trail leading back to the cirque itself (a glacial ampitheatre-shaped hollow), although the pond created there is largely turned to mud by the drought. I pick out the best tent platform building a roaring fire with driftwood from the cirque, although just as we sit back to enjoy it, we notice a light mist beginning to fall. In a few minutes it changes to a light snow and sleet, and we hurriedly move our gear inside as it intensifies, hanging the bear bag and covering the packs. We turn in at 9:45, with the now steady rain continuing throughout most of the night. 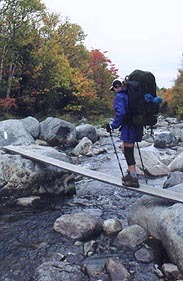 Crossing the Carrabassett - don't know who left the plank, but it sure helped. Today promises to be our tough day - the only one with two climbs, the 2nd of which is a arduous afternoon climb. We're up at 6:30, the rain having mostly ceased, although the wind in the trees periodically showers us with torrents, so the pack covers stay on today. Our day starts with climbs over South and North Crocker peaks, a climb which seems taxing, as all peaks around are solidly encased in clouds. Descending between them, the clouds break up momentarily giving us a spectacular view of North Crocker looming before us. The wind up here is frigid, and we quickly don our jackets, although our view is short-lived, and we'll cross both peaks in the familiar gray coccoon. We descend to ME 27 - a popular hitch into Stratton, but we're a tad behind schedule, and choose to lunch aside the road, watching the logging trucks roar by. None of them would have stopped for us anyway, but just as we cross the highway, a van slows to pick us up, even though we wave them on by thankfully. Passing a private school group getting ready to hike, we wind back across the bogs and into the woods, the climb beginning soon after - gentle at first, but increasingly steep and rocky as we head up. 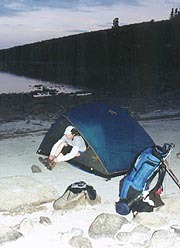 Soon it's genuinely grueling, but there's a brief respite at Cranberry Pond, taking a welcome break at a beautiful tentsite. Soon after it's a genuine rock climb, passing through some house-sized boulders some have described as a "mini-Mahoosuc Notch". Finally we reach the crest, with a short level walk until seeing Horns Pond off our left and finally coming on a small, decrepit Lean-to. Before getting too alarmed about its condition, we find it's an old day-use shelter, and that there are two new lean-tos down the path, more typical of those in Maine, and facing the Bigelows, which we'll climb tomorrow (we were hoping they'd overlook the pond, as we're still looking for the elusive moose). We choose the lower one as the most level, and I set up camp as Coleen heads to the spring, finding it dry, with a sign pointing her to the pond. She wants my help there, so we both head over to the pond for water, checking in with Caretaker Shana on the way back (just finishing up her term here before moving up to Juneau). Our tough day over, we relax over dinner and hot drinks, finding it balmy compared to previous nights; although before we retire at 9:30, the clouds again swirl in filling our alpine nest. "The Promised Land always lies on the other side of a Wilderness." Coleen wakes me elatedly, the sun having come out, the Bigelows ahead looming tall in the sunshine, and with them the end of our "tough" climbs for this section. It's short-lived however, as the clouds soon close in over the peaks, before we climb out. The climb over South Horn isn't bad, with a short level section before climbing West Peak. The latter's a sheer rock scramble at the top, though the winds are light - eerily so, as we climb silently through the clouds over its summit. We meet a day hiker up here doing his 23rd of his Columbus Day ritual, but otherwise it's deserted as we descend down into the col between the peaks for a break. The steps of the deserted caretaker's cabin here make a nice place for our quick break, and soon we're off again for the quick hop over Avery Peak, with some tough bouldering as we approach the top. 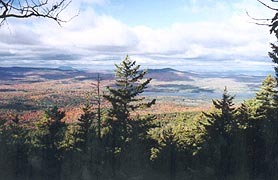 As rocky as its companion, Avery Peak is graced by what appears a small fire tower and a plaque commemorating Myron Avery, an instrumental figure in the creation of the AT. It's a relief to have the tough stuff behind us as we start down through the silent fog, though our spirits decline in the gray as the day wanes. Safford Notch brings another area of huge, house-sized boulders, with lunch in a cave under one of them as the rain begins to fall. 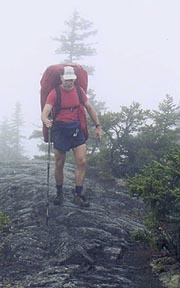 A couple groups of weekenders pass as we start up once again, with a monotonous climb over Little Bigelow, an endless and rough ridgewalk atop, followed by an even more endless descent, worsened by the wet, rocky trail. Coleen slows badly, especially disheartened after sliding back down one rock face we climb over. On returning to easy trail, I suggest she pick up the pace, but she takes another fall coming down a subsequent rock slab, so it's obviously time for a break. I stop and help her up, and we take it very slowly to the Little Bigelow Lean-to, taking our break here at the cutoff trail without even going back to the shelter. We have a quick strategy session, as our planned campsite (Long Falls Dam Road) won�t arrive until after dark, and we've no idea if the creek shown there is running. We elect to push on in spite, taking a bottle of unfiltered water from the creek here for that eventuality. 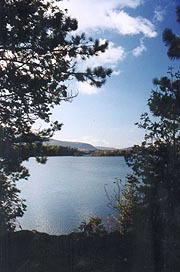 To my amazement, Coleen�s totally revitalized after the break, taking off almost as fast as I can hike, making well over 2 mph to East Flagstaff Road, the trail turning to follow the shore of the beautiful Flagstaff Lake before crossing one more hill to our destination. Winding around the lake, there's a surprising amount of sandy beach around its low waterline, and with the weather clearing and night approaching I strike on a grand idea � why not camp here on the beach? Coleen�s quick to agree, and after searching for a private spot, we backtrack down the beach to our original point of passage. We find a level area in the sand just right for our tent, with a couple nicely rounded boulders on which to sit, and mounds of driftwood around for a fire. It�s idyllic, and the clouds clear even from the peaks as the sun sets at the opposite shore of the lake. We�re in heaven here, and though there�s a house across the lake, we�re hidden by his woods, getting a nice fire going, and tramping out the sand to level our sleeping area. Soon Coleen�s bathed and supper�s on, having a surprisingly good scrambled eggs dinner and a cup of noodles. A beautiful starry sky comes out as we dry our gear around the fire, turning in smiling widely at 10:00. Why do we always summit AT peaks in howling wind and zero visibility? One of our favorite campsites to date! who, by indigestion, a restless night and a rainy morning would have proved a coward." We�re greeted by a beautiful morning, a light fog clearing quickly from the lake and the few clouds from the peaks around. Shaking all the sand out of our gear, we�re out at 8:05, making fast time on the level trail, feeling great about last night's camping choice, although it'll be a long day today. 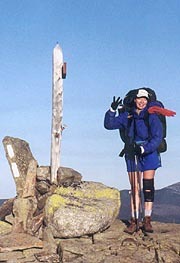 We begin with a couple speedbumps, with Coleen falling behind descending the 2nd - Round Top Mt. We take a break at the West Carry Pond Lean-to, a little disappointed to find it off the associated beautiful pond. Coleen heads on as I take some pix, catching up to her at Arnold Point, after which we pass a couple on a day hike, finding that they�re staying at Harrison�s Fishing Camp, where we�ve considered trying to wrangle our way into a stay tonight (even though they normally want 2-night reservations). Lunch is at a minuscule sand beach at the equally beautiful, but windy and frigid East Carry Pond before pushing on along the easy, but poorly blazed trail (at one place the trail forks, with both forks sporting a white blaze). We arrive at the beautiful Pierce Pond Lean-to (right on the pond�s edge) early, trying to call Harrison�s on the cell, but ending up having to walk down. 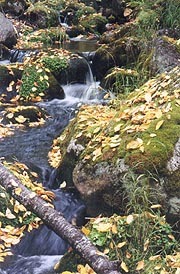 The AT follows a precarious crossing of a beaver dam, following the creek down to the lodge, which is perched atop a hill overlooking the stream and its waterfalls behind us. We cross a long array of bridges to get there, a generator furnishing a small plume of smoke as they prepare for the evening meal. Inside we meet Fran, who�s hospitable, but hasn�t got a cabin made up we could use, though she offers us the use of the phone and water. We head back over on the shorter blue-blazed trail, three guys pulling in as we do. We�ll find Sean and Rob the team �Brits�, a couple of English marines doing a cancer benefit (biking across Canada, kayaking the Missouri River from its headwaters to St Louis, and now hiking the AT southbound). Joined by their old friend Kevin, they're an interesting trio, though they�ve a daunting task ahead, having gotten started about a month later than intended. They�re already being pressed hard by the terrain, with major aches and pains dogging them, as well as the cold (both conditions about to get far worse). We build a huge fire, chatting around it for some time before Coleen and I turn in to our tent by the water�s edge, treated to numerous choruses from the loons as we nod off at 8:55. So do our minutes hasten to their end"
Today we'll cross the Kenebec River, the one place on the AT where fording is verboten following the drowning death of a hiker in 1985. While the river is normally only knee to thigh-deep, a dam upstream releases water at irregular intervals, raising the level to a dangerous chest-high in a matter of seconds (once the water is much over waist-deep, a person's natural buoyancy lifts them off their footholds, sweeping even the strong off their feet). As a substitute, they've set up a canoe ferry service with Steve Longley, a former hiker who's done this for 16 years, although tomorrow is to be his last day as such, a real loss to the trail community. The alarm wakes us at 6:00 for our long day ahead (hoping for a town meal in Caratunk), and we prep quietly, all the guys still asleep in the shelter. 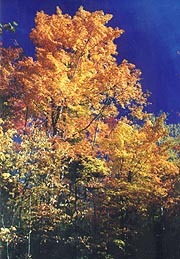 After briefly watching the fog clear across the lake over coffee, we�re off, taking the blue-blaze to the AT. It�s a gentle downhill trail, following the creek to the Kenebec, though the poor blazing causes us a little meandering on the way. We get there at 9:05 to see the canoe just leaving the other bank - Steve�s helper Raney is paddling today, bringing a southbounder across. 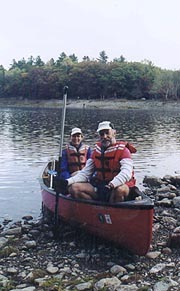 After the standard release forms, we load up, Coleen riding amidships as I paddle in the bow. We'll find Steve on the other bank, having heard us talking to Raney about a town meal, offering to run us up to a nearby restaurant. He�s a really nice guy, and we find the Northern Outdoors everything promised, with a great menu and some well-appreciated steaming coffee. We take a sumptuous and leisurely breakfast here, catching up on CNN (the big story is still the DC sniper), the skies graying outside as we engorge ourselves within. But we�ve miles to go yet, securing a ride back to the trailhead from the counter girl, the sky looking as though it could rain any time. At least it�s an easy climb out, with a break at the Pleasant Pond Lean-to, finding the area laced with logging roads, some with hunters milling about. Pulling in, an apple falls just ahead, and we�re pleased to find an apple tree with plenty of ripe fruit � a welcome addition to our snack fare, if a tad tart. 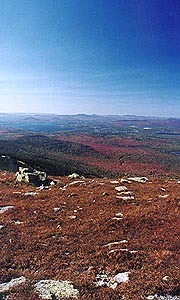 After the break, the day's challenge is the hop over Pleasant Pond Mt. - yet another steep climb, leading to a typical rock chute requiring some hand-over-hand climbing (that terrified Bryson in 'A Walk in the Woods'). Once atop, we envision an easy descent, but we�ll be proved wrong, as the trail follows the exposed crest all the way to the bottom - all of it brutally rocky, and most requiring substantial boulder climbing that doesn�t even show on the profile (and treacherously wet in the rain). We plod ahead, passing a few day hikers and one anti-social long-distance hiker hiking our section southbound (I ask how far he�s going, and without even slowing he mutters, �100 miles�). Suddenly, we pass the powerlines just before Moxie Pond, and moments later we�re there, stopping to help out a lost woman in her SUV. As the rain increases, Coleen�s now resolute about getting to the shelter tonight, even if after dark; so we decide to push on across Baker Stream. There�s a dual cable tightrope strung across here somewhere (we know it from a National Geographic article on the trail - it never was part of the official AT), but we can�t find it to take my picture there, so we rock hop across, and begin the gentle climb towards the Bald Mt Brook Lean-to. It�s easy trail for a while, following some jeep roads, but suddenly it becomes a rock scramble just as serious dark falls; so the headlamps come out. We wind through the dark, wet woods, counting down the minutes to the shelter, but suddenly the path ends at a large pond, one blaze ahead on a tree out in the water. It�s a long way across, it�s pitch-black and raining out, looking at least waist-deep, muddy enough that the bottom isn't visible, with probably a foot of gripping mud underneath � the ugliest ford I�ve seen in some time (I�d much rather have forded the Kenebec). We're at a loss, but after a little searching, we find a trail bushwacked around the side, albeit unblazed. We try this route, ending up walking across a narrow beaver dam that solves the mystery � the beavers have flooded this portion of the trail. We�re very relieved that someone found this workaround in the daylight, and soon we�re back on the trail. A few minutes later we cross Mountain Brook, a bit surprised to find a Toilet sign here, as we�re a solid 1/2 hour early for the shelter. We find a spot under the spruce that�s slightly drier to check our paperwork, finding that the shelter was a mile closer than we�d anticipated � we�re here! 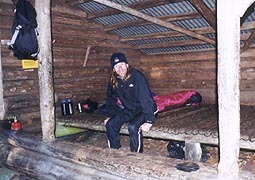 Elated, we hike the final, confusing 200 yards up the shelter trail, finding it clean, spacious, and unoccupied. The deluge outside is steadily increasing, so we quickly get some water and start dinner � a Richmorr honey-lime chicken meal that�s delightful. It�s so nice to sit in a dry shelter as the rain drums on the roof, and after hot drinks and some register-reading, we turn in at 10:15. 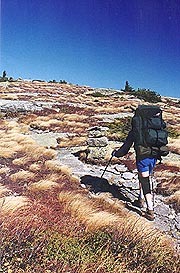 The wet, rugged, and exposed descent from Pleasant Pond Mt. "Whether you think you can, or think you can't; you're right." We wake at 7:00 to a cold and windy, but beautiful morning out, with clear skies ushered in by the passage of a cold front. Even though Coleen intends to spend the night at Horseshoe Canyon, I somehow know from the get-go that we'll probably end up in Monson somehow. We�re packed in good time, and with high spirits, we're afoot in just an hour. Our initial challenge is the climb over Moxie Bald, which starts with surprising ease, though we suspect some little chamber of horrors awaits us at the top. Still, we climb with little difficulty (I get a quick view of a moose crossing the trail ahead, but Coleen is too far behind to see it). Just after passing the bad-weather summit bypass, the winds hit us, and with the top nearby, we don our jackets, which will remain on all day. We pass a trio of men out for a weekend hike, and after a brief chat, make the final climb to the summit, passing some unusual rock formations nearby. The clouds are broken, giving a spectacular view from the fire-scarred summit, though after a brief cheer on completing our final climb, we hastily retreat out of the icy wind. The descent is equally easy, and we�re amazed at what a difference a day makes, making excellent time to the Lean-to for our am break. 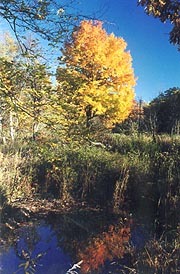 It�s a beautiful shelter, a pair of Meragansers swimming on the adjacent lake, replete with autumnal color. As we chat, Coleen proposes pushing on to Monson, given the temperatures out - I had a feeling this point would come. We forge on, making good speed in hopes of reaching Monson in daylight, winding through fairly easy trail around the various lakes and streams dotting the landscape. We rock-hop a crossing of the Moxie Lake outlet, winding through the forest and coming on our �ford� of the West branch of the Piscataquis River quite a bit earlier than expected. We stop on the far bank for lunch, but we chill quickly, resuming our trek amongst the beautiful autumnal color on both banks of its gorge. The trail becomes tougher though, seeming to climb and descend every river bluff, and we�re both tiring and slowing, Coleen tripping over a root just as I�m catching back up from a photo op. Still, we pass the Horseshoe Canyon Lean-to earlier than expected, with Coleen still wanting to push ahead to town. Our final and largest ford is the East branch of the Piscataquis, which appears as expected, although it�s not so bad as we�d anticipated. The beavers have dammed the first portion, making an easy rock / log hop across, and a newly erected beaver dam spans the 2nd half. It's a bit fragile for us to cross, but just to our right someone has supplemented a gravel bar with a few large rocks and logs, making a fairly easy hop across. On the other side, we climb past the Shirley Blanchard Road for our final break before launching the final assault on Monson. We forge through the woods, the trail occasionally becoming a bit rough as it winds through the woods amongst snowmobile trails, parallelling one for some ways as if to tempt us. Soon we see Lake Hebron appearing to our right (which abuts Monson), though by now darkness is falling quickly, and the trail tough to follow. Just as we�re about to get out the headlamps, we run into the cutoff to town, pulling out the cell phone and finding our good ol� room 1 at Shaws vacant, with Keith offering to give us a ride in. A few minutes later he picks us up, and we�re even more pleased to find there�s still dinner left, which we dive into immediately � large chicken breasts with all the usual trimmings, and apple pie for dessert. After the usual chit-chat with the Shaws we retire to our cabin, where I download email as Coleen heads for the bath. She can�t make the stopper work, and after her lengthy shower, I run out of hot water, but I�m basically clean nonetheless, and we retire to a relaxing evening, Coleen sound asleep by 10:00, and me at 11:10.
but from liking what we have to do." Monson is the beginning of the "100-mile wilderness" - the final leg of the AT pilgrimage, and with no public roads through the wilderness, there'll be no "town meals" or resupply. With this in mind, we'd like to start our final hike next year from ME 15 - the last bit of civilization before the wilderness, but 3.3 miles further down the AT from where we walked into town last night. We've decided to knock off this short stretch this morning, before launching off to Bar Harbor for some well-deserved vacation. We're up at 6:00, glad to have a bit more time to get ready, and with everything together we head across the street for the usual mammoth breakfast fare (I can almost feel my arteries hardening as we eat), joined this morning by Exodus 96, who's hiking southbound towards his home in PA (although he plans to bypass the Whites). Pat's not up and around, but the elder Keith more than compensates, although I'll find it interesting that he served in Berlin in 1946, taking two bullet wounds from a disgruntled Nazi soldier. He's volunteered to drop us at the AT (and spot our car to the other end), so after a leisurely conversation around the table we all get packed, settled up, and head for the trail, leaving our car at 15. It's an interesting chat with Exodus heading over to the AT (he did the PCT in 98, and hopes to do the CDT some day), and moments later we�re afoot. It�s easy trail, especially without our packs, and as the trail turns uphill, Coleen sheds her Nuptse in spite of the beautiful but frigid day. There�s plenty of autumnal pix to be taken (even though the trail never leaves the woods), and it�s not long at all before we start hearing the traffic on ME 15. We pull back to the car in just over an hour, and our longest trek to date is complete - 8 days, 105.5 miles, and the conviction that we're indeed worthy of the rugged Maine landscape.